Spring sun gently warming the trees quickens the sap flow. Plunk, plunk, plunk. Sounds of droplets hitting the bottom of the buckets echo through the woods as the contents are collected and the buckets re-hung. Sunny days of gathering, with crisp weather hovering at about the 3 degree Celcius point are wonderful days to be out in the woods. Such days engage my senses. I get to view nature in its purest, capture snapshots of tranquillity as I set out to gather this day’s harvest. Sun glistens off of the snow, light sparkles through icicles. Sap tastes like sweet snowflakes. 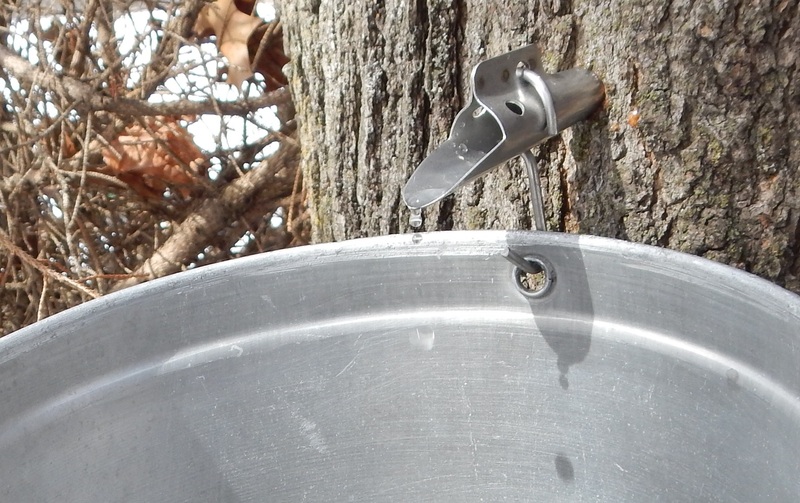 As I progress, a calming steady rhythm begins -droplets of sap hitting the bottom of buckets. The beat picks up the more buckets I empty – plunk plunk plunk, plunk plunk. It turns into an orchestra of plunks with me as maestro.